Nov. 1, 2010, 10 a.m.
Jim Hopkins’ Gannett Blog: a useful watchblog finds its niche; should others emulate its “water cooler”? By Martin Langeveld @MartinLangeveld Nov. 1, 2010, 10 a.m.
Last year in this space, I took a swipe at Gannett Blog, a “watchblog” published by ex-Gannett journalist Jim Hopkins of San Francisco in which he had been keeping an eye on the country’s largest newspaper company. At the time, Hopkins had announced the impending shutdown of the blog, so that he could regain his health, and was engaging in a self-indulgent countdown to oblivion. “Jumped the shark” was my judgment. I’ll stand by it, and I think Hopkins might agree. But today, Gannett Blog is back in action, without the nonsense. Hopkins is running a tight ship, publishing a lively blog that’s serving a useful niche both for Gannett employees and Gannett watchers. It’s a niche filled for few other U.S. newspaper publishers, and certainly none do it as well as Hopkins. Hopkins spent 20 years with Gannett, beginning with now-defunct Arkansas Gazette, and ending as business reporter for USA Today, from which he took a buyout in 2008. He had started Gannett Blog anonymously in mid-2006, and only added his name to it after leaving the company. A few months before that, he was writing “for maybe eight readers — on a good day.” But then he posted a breaking news piece on a major investment in Gannett by Brandes Investment Partners; Poynter’s Jim Romenesko linked to that post; and Gannett Blog’s traffic soared. And so, on Dec. 9, Hopkins resumed publication. Mindful of his yearning for a return to traditional journalism, this time he stuck to straight news, without the contentious tone of its earlier period. By setting a different tone on the news side, he felt that he could “dial down the volume of the anger” in the comments, and he has largely succeeded in this goal. Gannett, with its 80 dailies and 23 TV stations, “is like a small city,” Hopkins says, “and I’m a beat reporter. I can find things going on on a daily basis.” It’s a lively, engaging mix: In one recent stretch, there are posts on growth in Sunday home delivery being reported by Gannett (along with a report that the Detroit Free Press lost 9 percent in circulation), tips for employees on accessing a new health benefits site, a few public radio-type pitches for reader contributions, and a reproduction of a USA Today front page filled with content that would most appeal to a younger audience, topped by the question “Is this a front page for older readers?” — shortly after publisher David Hunke said the paper’s printed edition would be aimed for an older demographic. An innovation on Gannett Blog, inspired by the fact that comments were getting more pageviews than anything else on the blog, is the open-ended “realtime comments” post that’s always at the top of the page. It simply says, “Can’t find the right spot for your comment? Post it here, in this open forum.” Hopkins refreshes that post once a week; it often garners more than 100 comments — far more than his typical posts do. Hopkins calls this the “water cooler” — a place to “come and see what other people are thinking about.” Sometimes he kicks it off with a question (“How’s your week looking so far?”), sometimes not. Virtually all the comments are anonymous posts — most of them clearly from Gannett employees — that provide a window to at least a part of the company’s zeitgeist, and sometimes give Hopkins good leads. Despite the anonymity, and probably because of the collegiality, the tone is constructive and there are often useful discussions. I can’t think of other blogs that have created this kind of open-ended forum within the blog, at least not within a simple Blogspot format. Is a “water cooler” spot something that other bloggers should try out? Blogging not a lucrative proposition for Hopkins — between Google ads (the display format brings in much more than the AdWords did, he says) and reader contributions, he aims to make $4,000 per quarter, but in actuality he “might make” $10,000 this year. So Hopkins is to be commended for carrying on a useful labor of love. But as I asked last year, where are the rest of the watchblogs (or watchdog blogs)? When he relaunched Gannett Blog, Hopkins also started up similar blogs focused on News Corp. and the New York Times Company. They’re still online, but Hopkins gave up on them when they failed to gain traction. (Both have “water cooler” threads, but nobody stops by, apparently.) Hopkins thinks the explanation lies in the fact that such a large fraction of the New York Times Company employees are based in New York and can trade information in the workplace, while News Corp. is such a diversified operation that its various film, television, publishing and other media enterprises have little in common. Toasted Posties: Perhaps the original watchblog, launched in 1995 (before the word “weblog” was invented) by the employees left out in the cold when MediaNews Group shut down the Houston Post. The original Toasted Posties was, simultaneously, a sort of Facebook for the Posties to keep in touch with each other and coordinate reunions, and a gatherer of news and gossip about MediaNews and particularly about its CEO Dean Singleton (to whom I had the pleasure of demonstrating the site in 1996). The site (which has not preserved its archival content, except for a nice photo collection worth visiting) now refers readers to a Toasted Posties blog, launched in 2005, which fizzled out in 2007. The NYTPicker — Operated since 2008 by “a team of journalists who prefer to work in anonymity, the NYTPicker reports on the internal workings of the nation’s top newspaper, and comments on its content.” The “nyts” it picks are mostly concerned with with content — its first post, for example, quibbled with the use of “disgraced” in reference to Elliott Spitzer — and there’s actually not much about the “internal workings” of the paper and rarely anything about the company that owns it. Hartford Courant Alumni Association and Refugee Camp — Run by 22-year Courant veteran Paul Stern, more as a networking site for Courant alums then as a source of news about the paper. 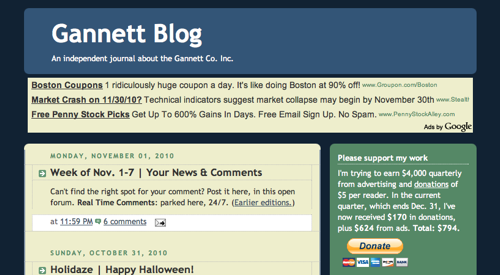 Gannettoid — Still posting an occasional Gannett news item, but nothing like the reborn Gannett Blog. MediaNews Monitor — maintained by the Newspaper Guild for its members in several MediaNews clusters; has a mix of industry news, Guild news, and MediaNews updates, but no comments or discussions. Lee Watch — an anonymously operated, reasonably active blog focused on Lee Enterprises. McClatchy Watch — formerly CancelTheBee and still using that URL, but defunct as of December 2009. TheLedgerisBurning — defunct since 2008; focused on Advance’s Star Ledger. Tribune Watch — another Guild site, focused on the Tribune Company. It contains a link to Tribune Employees Talk, which has been defunct since December 2008. Also inactive in the Tribune space is Maria Padilla’s Sentinel Watch, which reported on Orlando Sentinel doings until May 2009. Ditto, The Amazing Shrinking Orlando Sentinel, and Tell Zell (What You Really Think). POSTED Nov. 1, 2010, 10 a.m.
Langeveld, Martin. "Jim Hopkins’ Gannett Blog: a useful watchblog finds its niche; should others emulate its “water cooler”?." Nieman Journalism Lab. Nieman Foundation for Journalism at Harvard, 1 Nov. 2010. Web. 22 Apr. 2019. Langeveld, Martin. "Jim Hopkins’ Gannett Blog: a useful watchblog finds its niche; should others emulate its “water cooler”?." Nieman Journalism Lab. Last modified November 1, 2010. Accessed April 22, 2019. https://www.niemanlab.org/2010/11/jim-hopkins-gannett-blog-a-useful-watchblog-finds-its-niche-should-others-emulate-its-water-cooler/. | title = Jim Hopkins’ Gannett Blog: a useful watchblog finds its niche; should others emulate its “water cooler”?